This entry was posted in rules for writing and tagged Robert A. Heinlein by James Scott Bell. Bookmark the permalink. Good article, Mr. Bell. Thanks. I too am a “pantser” though I don’t care for the term. I trust my subconscious and let the characters tell the story since they’re the ones who are living it. But I do write without having first laid out an outline. I also “revise” what I wrote the day before at the beginning of the current day’s first writing session, but I don’t consider it “rewriting.” I see rewriting as a conscious-mind activity, during which the writer focuses on words and sentences instead of Story. Re Rule 3 (“…refrain from rewriting except to editorial demand”) Harlan Ellison added an addendum: “And then only if you agree.” (grin) As a possibly interesting side note, in the original essay where Heinlein laid out these business habits, he also said he’d fallen off his own rules several times. Also this process enables me to be “unstuck in time” (as one professional writer called it). If in the midst of Chapter 27, Aunt Marge pulls a revolver from her housecoat (surprise! ), I cycle back to an earlier scene and let the reader see her slip the revolver into her housecoat. Many successful writers outline, some in great detail, before writing the novel. I don’t for the same reason I don’t watch a film about which someone has told me every major twist and turn and the ending. For me, that process would be boring. Many successful writers also rewrite. Again, I don’t. I see rewriting and “polishing” is the quickest possible way to erase my own unique voice and replace it with the voice or style of others. I would love to turn a phrase like Bradbury or Chandler. But that’s me as a reader. Who am I to say another reader won’t prefer the way I turn a phrase? And many successful writers simply write. I’m in the midst of my 36th novel and have written almost 200 short stories. I am not a master, but I am a practitioner. Maybe most important of all — and this goes directly to Sawyer’s sixth rule — instead of hovering over the same novel through [insert number here] of rewrites, I’d rather submit the current work for publication or publish it independently, then start on the next novel, novella or short story. It is through practice — writing, which I define for myself as “putting new words on the page” — that the writer improves in the craft. But I admit my process is selfish and self-serving. My characters continually surprise and entertain me while simultaneously releasing me from responsibility for what they say and do. As a result, I’ve never considered writing “work” or “drudgery” or, for that matter, a calling from on high. It’s just what I do, and it’s a ton of fun. Incidentally, I also provide my own take on Heinlein’s Business Habits for Writers, annotated, of course. Readers can download a free copy by clicking http://harveystanbrough.com/wp-content/uploads/2016/08/Heinleins-Business-Habits-Annotated.pdf. Thanks again. I appreciate being included in the conversation on this craft we all love. Thanks for all the thoughts, Harvey (and for being the spark for this post). Your practice of rereading your previous day’s pages is one I emphasize when I talk about revision and self-editing. It does keep you in the flow…I also like to leave off writing in the middle of a sentence. That way I jump right back into the river. I prefer the term “Planster.” If I’m writing a mystery, I know the crime has to be resolved. If it’s a romantic suspense, I know the mystery will be solved AND the h/h will fall in love. How it happens is where the fun of writing is. My process is very similar to Harvey’s. When I finish a scene, I print it out and read it in bed where it’s not a “work” environment, making very sketchy notes, which is where I start the next day. My first draft is cleaner than those who use a “fast draft” or “NaNo” system, but I’m always afraid I’ll forget to put that gun in the housecoat if I wait! But I also have a foamcore board covered with sticky notes of things to fix/check. Terry, I just did a lecture on revision and talked about my own longstanding practice after completing a MS. Put it away for 5 weeks and work on a new project. Print out a hard copy. Make a “cover” which has a blurb of how great the book is. Then read the book like a reader, marking the text minimally (for obvious things) but trying to get that overall feel. Then the work begins! Love this idea, JSB. It’s often painful for me to go back after so long–cringe-worthy even. But then there are nice surprises. To read one’s own work as a reader is that shimmering goal. Terry–printing out in another font: genius! I would add another rule: You must market yourself regardless of your method of publication. It used to be that readers sought out authors. Remember being a kid and penning a letter to the author and sending it via USPS to the agent listed in the back? Now it’s the author that seeks out readers through a blog, Twitter, Facebook, or whatever. Indeed, Priscilla, even the lords of the Forbidden City require an author to do the lion’s share of the marketing. The key is to figure out what methods are best and what takes away valuable time from the most important work we do: writing quality books. If only there was a book that laid all this out! People keep quoting Hemingway for the “sit down at a typewriter and bleed” bit. He never said it. It was Red Smith, the sports writer. They gave that line to the guy playing Hemingway in a TV movie some years ago. I also think Elmore Leonard was a little “cheeky” in his famous advice, which is always treated as holy writ. Thomas Wolfe, (LOOK HOMEWARD, ANGEL, not BONFIRE OF THE VANITIES) wrote standing up because he was really tall with back problems. He used the top of a five-foot refrigerator as his desk. You can see it at his home in Asheville, NC. I pretty much have your take on his “rules.” Writing and finishing are vital. However, #3 is the one which some writers take as gospel to mean “never rewrite or revise.” In my case, rewriting, along with feedback from beta readers and an editor and thus more rewriting, is *essential. * I think Rob Sawyer’s rule is essential as well–always be working on the next thing. Dale, you speak truly! Emotion…the fictive dream. Has to be there! I would add Rule Seven – James Scott Bell’s Rule: Continue studying the craft. I love the part about starting something new if you’re experiencing a block. I used to beat myself up for not sticking with one project until the end, but switching gears actually helps me come up with new and better ideas for the first project. Thanks for the great reminder! This only works if you finish your projects. I’ve had students who never finish anything because of this method. The bright and shiny newness of the project attracts them because it’s all spurts of inspiration instead of the slog that comes later through the gritty details. I am bad about not finishing. If I start getting bored, I chuck it. Last year’s writing project was to corral all the stuff I’ve written over the years (still have about a zillion columns and 1 short story to round up). This coming year’s project is to finish my favorites. It also occurs to me I should send out some of the stuff I did finish. Anybody know how to juggle 3 jobs? Give up sleep, divorce your family and friends, and have no life. That will only work for a year or so before you either start making enough to justify the work and get rid of a job or two, or you wise up and realize real life is more important. Thanks Marilyn. I am surrounded by real life, which overall is a good thing.. I don’t know how to state this addition but it’s one of my guide posts. Maybe you can help me flesh this out. Push the envelope of what & how you write to avoid complacency. Write off balance from your comfort zone to keep learning your craft & stretching your ability to tell a story. Have a good day, Jim. Thanks for starting mine on National Mutt Day. I like it. “Write off balance.” Go places that make you nervous. As Ray Bradbury put it, jump off a cliff and grow wings. Jim, good commentary on rules, some of which I accept at face value, others require some comments and revisions (which you’ve done). Thanks for sharing. In this electronic age, there is truly an expert on even the most obscure subject. Do your research! If you don’t, I guarantee someone will catch your mistake and blab it all over the Internet. 1. Glock’s don’t have a safety switch on the side. 2. They don’t draw a chalk line around bodies on the street anymore. 3. No cell phones etc. in the 1980s. 5. Cops don’t engage in random shootouts. Firing your gun is a big deal, especially if uninvolved citizens are present. Indeed, when it comes to weapons, there’s a whole lot of experts out there who will pounce. Good reminders. It’s also nice to have an editor who knows some of this stuff. I once read in a mainstream thriller about a cop putting on his “mylar vest.” Really. The visual on that is hilarious. I’m with Harvey (and a pantser, too). If the story is broken enough that I have to revise in the traditional sense, then I royally screwed up the first draft. I started writing when I was eight, and it was very natural for me to move around in the story like a pinball and add this here and that there as the story evolved. And fix typos. By the time I got to the end of the story, it was finished and fairly typo free. But I listened to all the writing advice that said “rewriting is writing” and “write straight through before you touch it”–and I broke my writing. I turned to outlining to fix the problem, and it made it worse! I didn’t realize that revision was a false safety net. It was causing my stories to be born broken, and once they’re broken in the first draft, it was very hard to fix the problems because each change would break something else. So I ended up dumping all the writing advice I’d learned along the way and returned to my original process. I improved so much that one of my books was included in a StoryBundle. If it works for you and (I quickly add) the readers, then keep it going. There’s one rule there I might take slight issue with. Finish what you start. That’s good advice 99% of the time because we all get terrified about mid-stream when things aren’t going well and we want to just give up because that’s easier than moving ahead. Or maybe, as Cynthia said, we get bored and want to look for the next shiny object. (I think you stick it out and move on). But I do think that once in a great while, you have to step back, take a hard cold look and reassess: Does this story have enough meat for a full novel? Is this story been told before by too many others? And the worst — was this a bad idea from the get-go? If it’s that last one, I think you shouldn’t finish. You should set it aside and move on to something else. Then, after enough time has passed (for me, it took a couple years with one stagnant story), you can go back and look at it. Sometimes, you’ve improved enough in your craft to save it. But often, you just have to euthanize the dreadful thing. As I mentioned in the post, Heinlein was talking about short stories. Much easier to finish! Jim, I have the original essay (and book) in which Heinlein laid out his Business Habits for Writers. He included them, almost as a seeming afterthought, in an essay in 1947 in a book called Of Worlds Beyond: The Science of Science Fiction Writing. There are still copies available. But I have to point out, without assuming I know Heinlein’s intent, nowhere in the essay or in the rules themselves did he write or even hint that they were only for short stories. And really, if you read the rules, that assertion doesn’t make sense. They don’t refer to length, but only to the process of writing fiction. A couple of years ago, when I told another writer about Heinlein’s Rules, she immediately protested (without even reading them) that they would never work for her because she wasn’t a writer of speculative fiction. Silly. If I could amend them (but who am I to amend something written by such a successful writer?) I would simply add “No matter what fiction you write” to the beginning of each rule. Why is it that we all remember “A writer is the worst judge of his/her own work” when we believe the work is “good” but never when we believe the work is “bad”? In every case, ANY negative input coming from your brain is your critical, conscious voice. It’s trying to “protect” you by talking you out of finishing. If you don’t finish, you won’t publish and you won’t run the risk of embarrassment. Don’t listen. Push that voice down when you sit down to write. The truth is, the writer IS the worst judge of his/her own work in ALL cases. That’s because, at least in the first “draft,” the work is in your own voice, a voice that’s with you 24/7. To finish what you write, simply write the next sentence. Then the next, then the next. It really is that simple. The reader should be the judge of the quality of the work. Have a little faith in yourself. 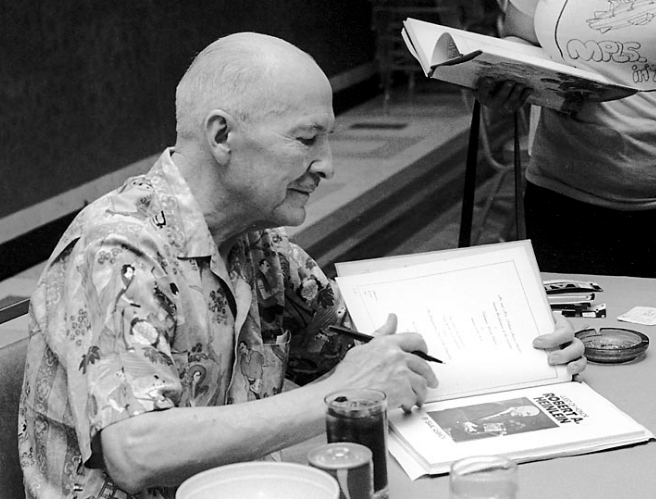 Follow Heinlein’s Rules, put the work out there and let the readers judge. Some will love it, some won’t. Then you move on to the next story.